Sometime in the first quarter vs. Stanford Monday night, Notre Dame’s five starters will score their 10,000th career point, which has never been done in the history of college basketball — women or men. There’s no question that milestone will be reached — the Irish need just eight points to get there. However, the real task at hand is finding a way to beat Stanford, a team that kept the Irish from the Final Four two seasons ago and derailed ND in the Sweet Sixteen the season before that. Despite the Cardinal’s showing in beating 11 seed Missouri State 55 to 46 on Saturday, Stanford will be a tough out. Like the Irish, Stanford is on a 12-game winning streak. They avenged their last loss — a 40 point beating by Oregon at home — with a victory over the Ducks to win the Pac 12 tournament championship. Three-point shooting plays a significant role in the Stanford offense — over 41% of Cardinal field goal attempts come from behind the arc. They connect on 34.5% of their three-point shots and average 8.9 made threes per game. When the threes aren’t dropping, Stanford’s scoring output will be down. The Cardinal were 3 for 29 from three vs. Missouri State and shot 25% from the field overall. Stanford shooters only made 36% of their two-point attempts. For the season, ND’s opponents have averaged 6.1 made threes, but they have only connected on 28.1% of total attempts. However, some teams have had more success — either when a player was on fire from three, like Chennedy Carter of Texas A&M, or when they launch a high number of threes, like Bethune-Cookman in the first round in the NCAA tournament. The Lady Wildcats took 34 three-point shots vs. just 26 inside the arc and connected on 9, nearly double their season average of three-point makes. Texas A&M was only averaging 3.8 made threes per game and Carter just 1.5 before she drained 7 of 12 vs. the Irish. In fashioning a record of 31-4, Stanford averaged 74.3 points, 40.6 rebounds, 15.3 assists, 12.9 turnovers, 7.1 steals and 5.1 blocks per game against a schedule rated the 7th toughest in the nation in the RPI. Outside of the crushing home loss to Oregon, their other three losses were all on the road — Colorado, Utah, and Gonzaga. They handed Baylor its only loss of the season limiting the high-scoring Lady Bears to just 63 points. Stanford’s shooting percentages are 44.3% overall, 47.2% from two, 34.5% from three, and 70.0% from the line. The Cardinal has three double-figure scorers in a line up that goes eight deep. Alana Smith, a 6’4” versatile senior forward from Australia, leads the Cardinal with 19.6 points and 8.6 rebounds per game. She shoots 51.6% overall and 39.7% from three. She’s made 79 three-point baskets, second on the team, while she leads the team with 77 blocks. Point guard, Kiana Williams, averages 14.1 points per game. The 5’8” sophomore is the team’s assist leader with 167 vs. 82 turnovers (2.0 assist to turnover ratio). She averages 34.3 minutes per game. She was 0-11 from three against Missouri State, but leads the team with 87 made threes (36.3%) for the season. Dijonai Carrington, a 5’11” junior guard, contributes 13.9 points and 7.5 rebounds per game. She converts 45.5% of her field goal attempts and 32.7% from three. She’s made 35 three-pointers. Like Williams, Carrington had a poor game against Missouri State — just 6 points on 2-11 from the field. She led Stanford with 22 points in the win against Oregon. Stanford’s other two starters are Maya Dodson, a 6’3” sophomore forward, and Lacie Hull, a 6’1” freshman guard. Dodson averages 7.1 points an 4.5 rebounds per game. She’s the only player on the roster who has failed to take and make a three-point shot. Hull averages 4.9 points and 2.4 rebounds. Hull’s twin sister, Lexie, comes off the bench to score 5.5 points and 4.6 rebounds per game. Other key reserve contributors are Shannon Coffee and Anna Wilson. Coffee, a 6’5” senior center, only averages 10 minutes a game and just 1.8 points and 1.7 rebounds per game. She has been playing more minutes lately. Wilson, a 5’11” junior guard, averages 2.7 points per game. She played 21 minutes against Missouri State and was second on the team in scoring with 11 points. Two years ago, Stanford upset Notre Dame in the Elite Eight 76-75. The Irish built a 14 point halftime lead behind 21 points from then sophomore Arike Ogunbowale. The Irish made 18 of 32 field goal attempts in the first half (56.3%), before shooting an icy 5 for 19 (26.3%) in the third quarter as the Cardinal cut the lead to two points heading into the fourth quarter. Stanford was 2 for 15 from the field in the second quarter, but made 17 of 29 attempts (58.6%) in the second half. 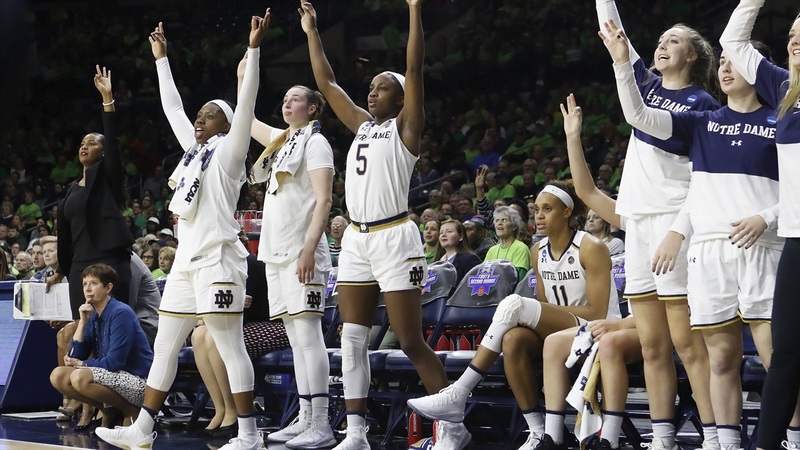 The Irish, playing without the injured Brianna Turner, set up a final shot by Ogunbowale to win the game in the final seconds, but she missed her last second effort. Three years ago, Stanford ended a Notre Dame 26 game winning streak and beat the Irish in the Sweet Sixteen, 90 to 84. The Cardinal built an 11 point half-time lead, hit 11 of 20 three-point shots for the game, and made key free throws to hold off the Irish comeback. The five Irish starters have combined for 9,992 career points: 2,551 (Ogunbowale), 2,298 (Shepard), 1,976 (Turner), 1,856 (Mabrey), 1,311 (Young). The tight game against Texas A&M was the first time Notre Dame has faced late-game pressure since the loss at Miami on February 7th. The Aggies erased a three-point Irish lead in the first minute of the fourth quarter to take a two-point lead. Jackie Young scored four quick points to restore the lead. After the Aggies knotted the score at 69, Arike Ogunbowale scored the next five points on a three followed by a steal and a layup to give the Irish a lead they would not relinquish. Young and Ogunbowale scored all 22 points for the Irish in the fourth quarter. Young made 4 of her 5 field goal attempts and went 2 for 2 from the line for 10. Ogunbowale was also 4 for 5 from the field — including her only three-pointer of the game. She was a perfect 3 for 3 from the line. The Irish made 18 of 33 field goal attempts (54.5%) in the second half and were a perfect 8 for 8 from the line. The Aggies could only connect on 13 of 32 field goal attempts (40.6%) after halftime. Irish starters played 192 of the 200 minutes with Jess Shepard playing all 40, Brianna Turner and Arike Ogunbowale 39 each, and Marina Mabrey and Jackie Young 37 apiece. The regional final in Chicago will be Monday night’s late game with a scheduled tip at 9 pm eastern. In-game, updates will be posted below.